Though my 15 year old 12 volt Porter Cable cordless drill is still alive and kicking (on a rebuilt battery pack) I really wanted an impact driver. After doing my research and having opportunity to try several different models at work, I was all set to pull the trigger on the white series Makita18 v LI drill driver set. When a good special was going on at HD just before Christmas, I went down to buy the set, but then stumbled across another great price on the DeWalt 20 vmax set. The specs are so close I decided to make my decision the old fashion way…. touch an feel. Both feel great in the hand, and both are looked like great tools. But to my sense, the balance of the DeWalt felt just a little better. Another nice feature is that the DeWalt has three LED lights set all around the driver. So I rolled the dice and took the DeWalt home and I’ve used them on a couple projects for a month. Now for the review….THESE TOOLS ARE AWESOME !!!!! Gobs of power…. light weight… batteries last a really long time… they hold their charge over extended periods when not in use….. well balanced…. they feel great in your hand…. the cordless drill is really fast…. the chuck is great. I’ve read complaints that the drills have excessive runout, but mine turns very true. They are a pleasure to use. The 20 vmax is a somewhat misleading name, as they are 18 volt units just the same as the Makita and Milwaukee tools, but DeWalt apparently used this name to distinguish them from their existing 18 volt line where the battery has a stem that runs into the handle, which DeWalt is continuing. Note that the XR (Extra Runtime) series has two differences… they have 33% more amp hours in the XR batteries and they have brushless motors that produce more power and use less amps. They also cost ~$100 more. I don’t feel like I’m missing much though, as the non XR 20 VMAX set is VERY NICE. If you haven’t used an impact driver like this before, they are the cat’s meow! The hammer action makes it much less likely to stop Philips head screws, and they can pond in 3/8 lag bolts with no trouble. 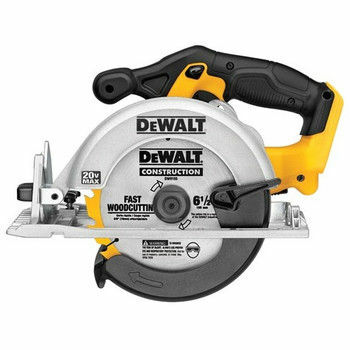 Matt, I used a friends 18v DeWalt impact when I built my deck. I loved it…..
Thnx for the review. I had one o these in my hands the other day, and thought, hummmm, this feels good. I went with the 12V MAX Lithium Ion DeWalt line…. I wanted the smaller size, for tight spaces. I purchased each individually, rather than a combo kit. I have 6 batteries & 3 chargers…. I think that should provide enough run time!!! But yeah, I like the DeWalts!!! I started with the 12v and it shined when I was installing a kitchen with a friend. Replaced the ignitor in my kitchen oven and used it there too. Used it on a deck and job and it was obvious it wasn’t intended for that kind of use. Ended up getting the 20v impact as well for that sort of work and love it. Get the radio if you don’t already have it. It both runs off the batteries and charges them as well. Randy, My coworker has the 12v LI drill and really like it too. I think that todays 12v has as much power as the age old bench mark 14.4 v models did. But are so much smaller and handier. Prior to the 18 v LI models coming out, the Panasonic 15.6 v was our favorite at work. Now the Makita 18 v LI is the favorite on the shop floor. But to my knowledge, the boss has never bought DeWalt, and I speculate this is because DeWalt usually cost quite a bit more. I just smile every time I pick one of these bad boys up. They are sooooo nice. I paid $199 for the set, and used a Home Depot gift card my wonderful MIL gave me for my BD. If you carefully check the battery, charger, tool chart, you’ll see that the XR 20 VMAX batteries will work in the non-XR VMAX tools. The operating manual says that the charge time is 30 min. And this is more than adequate for me, as I can’t see running one dry that fast. The Makita advertises a 15 min charge time, and I think they accomplish this by putting a fan in the charger to circulate air through the battery while charging, as LI batteries are infamous for generating a lot of heat while charging. I’ve read some complaints from contractors that the DW batteries are junk as they wouldn’t charge after only a few days in use. But I suspect this is because they are attempting to charge them on a cold job site. The operators manual says that you need to be > 50 deg. for the charger to work properly. I really like the Dewalt Li-Ion lineup. I have the 12v and it works great. I have the 20 volt DeWalt combo that includes the impact driver and the full size hammer drill and two 3 amp (the larger size) batteries. I have owned them for about 6 months now, and I use both tools every day at work and I love them. I paid less than $300 for the set and I’m so glad I bought the set I did. This is my first impact driver and I can’t believe I waited so long. Also, since I was getting the lighter impact driver for the majority of my work (compared to using a drill for driving and drilling), I opted for the beefiest hammer drill for the few times a day I actually drill a hole with a hand drill (I use the impact driver or the drill press for most of my drilling needs). My ONLY gripe is that I don’t like the metal chuck on my hammer drill. I tend to loosen the chuck by throwing it in reverse and holding on, but this metal chuck has gotten the best of me a few times doing that and can really skin your hand or grind up some finger nails. If I’m wearing my gloves, it’s not a problem, but bare handed this chuck is nasty! MH… I totally agree about the driver. How could I have waited so long. The impact action makes stripping Philips head bits a thing of the past. I have a corded Bosch hammer drill, and a 7 amp DeWalt spade head beast, so what I wanted was light and handy for the drill. I think the hammer drill chick has such a coarse texture so you can really tighten up on the larger bits it has the power to drive. Pros and cons to every design decision I guess. Matt, I’ve dated some chicks like that. I got my dad these drills for Fathers Day last year and he loves them, especially the impact driver for driving in long screws. These are definitely worth the money.